Let's do it for ME! is a patient-driven campaign to raise awareness and vital funds for a centre of excellence for translational biomedical ME research, clinical assessment, diagnosis and treatment for patients, training and information for healthcare staff, based at the University of East Anglia in the UK and aiming to work collaboratively with international biomedical researchers. ME is multi-systemic disease classified by the World Health Organisation in the chapter on Diseases of the Nervous System (neurological) at WHO ICD-10 G.93.3, which lists post-viral fatigue syndrome and benign myalgic encephalomyelitis. CFS (chronic fatigue syndrome) is a term that is listed in the alphabetical index with a reference to G.93.3. Different criteria for both ME (myalgic encephalomyelitis) and CFS (chronic fatigue syndrome) have been developed in different countries over the years. In the UK, CFS/ME has become an umbrella diagnosis for patients whose similar symptoms may have quite different causes, creating confusion for clinicians and researchers alike, and a barrier to useful scientific progress in this important area of human health. A group of international researchers has now developed a new set of criteria for ME, which can be used for both clinical diagnostic and research purposes – known as the International Consensus Criteria. Some 250,000 people are thought to have ME or CFS in the UK - 25% of those are severely affected and 10% are children. Some are so severely affected that they cannot move, speak or swallow. Studies at Dundee and Newcastle Universities found that 40-44% of patients with a diagnosis of CFS/ME were misdiagnosed and some had other, potentially treatable illnesses. Development of a reliable diagnostic biomarker and objective biomedical tests for the disease is therefore a priority. This will be of huge benefit to doctors and patients alike. Patients with severe ME have been largely excluded from research and also from treatment, as services have not been developed to meet their special needs and lack of research means that doctors have no evidence-based treatments to offer them. In a UK study, ME was found to be the biggest cause of long-term absence from school. Research carried out at Dundee University and published in September 2010 showed evidence of persistent underlying viral infection in children, the same as previously found in adults in 2005. This adds to the mounting body of scientific evidence of the biological processes at work in ME, yet there is no cohesive strategy for taking this research forward so that these biomedical findings can translate into treatments of the root cause of the disease and perhaps even prevention. Invest in ME is a small UK charity with a big idea! 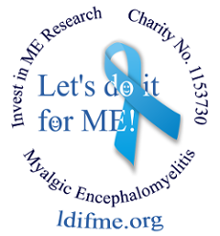 In 2010, at the 5th annual international conference on biomedical ME research (which it hosts) Invest in ME announced its proposal to set up a Centre of Excellence in UK, combining biomedical ME research with clinical diagnosis and treatment for patients and training for health professionals. A year on and almost everything is in place for this exciting new venture to go ahead. Patient care will be at the heart of the centre and clinical diagnosis of patients will be made using the correct and up-to-date diagnostic criteria. An important aspect of the biomedical research is that distinct patient cohorts are properly defined and maintained. The research being proposed by the university would be of the most advanced possible – using virology and immunology as the key for examining patients. Invest in ME has links with other researchers and institutes in Europe and Australia and has funded UK research by the innovative Whittemore Peterson Institute for Neuro-Immune Disease of Nevada, USA. Foundations are therefore already in place for international researchers to work collaboratively to advance science and provide the promise of better treatment and possible restoration of function and quality of life to a section of the community who have received very little help in the past, including children and the severely affected. Do you want to help us make this big idea a reality?